We are pleased to announce that FI2020 week was a huge success, including 34 partners, over 300 participating organizations, and over 700 participants in hosted conversations, and resulting in over 100 calls to action. 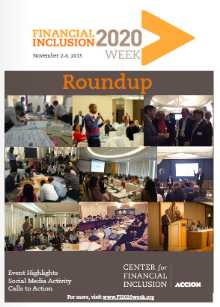 A new Financial Inclusion 2020 e-magazine sums up the week, with a focus on event highlights, social media activity, and calls to action. Accion and its partner in Nigeria, Accion Microfinance Bank: How to expand financial inclusion in Africa’s largest country -- increasing the scale of the microfinance banking sector, savings mobilization, MSME credit delivery, and potential opportunities in digital payments and channels. Accion’s Harvard Business School Program engaged with program alumni through a webinar on high-level findings from the FI2020 Progress Report on Financial Inclusion. A CGAP/Bankable Frontier Associates/FSD-Africa event in Nairobi focused on the opportunities and risks for retail credit, which has potential to help those Africans who are in the “cusp” segment to move up and build assets but also includes the threat of backsliding. Good Return hosted two events -- a Manila conference workshop on gender and a Cambodia workshop with the National Bank of Cambodia on their joint Consumer Financial Awareness Campaign. The Helix Institute hosted a webinar exploring microfinance institutions’ use of digital finance. Multilateral Investment Fund launched a report on what has been learned from a recent impact evaluation on savings groups in Latin America and hosted a webinar to share these findings and learnings on how savings groups can be linked to financial intermediaries. Watch the webinar. Tagattitude How digital banking is transforming the financial inclusion landscape in Africa. Vision Fund Zambia and Financial Sector Deepening Zambia (FSDZ): Promoting financial inclusion by leveraging Savings Groups and Microfinance Institutions. The World Savings and Retail Banking Institute: Making small savings work for customers and service providers.